Ok, so the way this works is pretty simple. 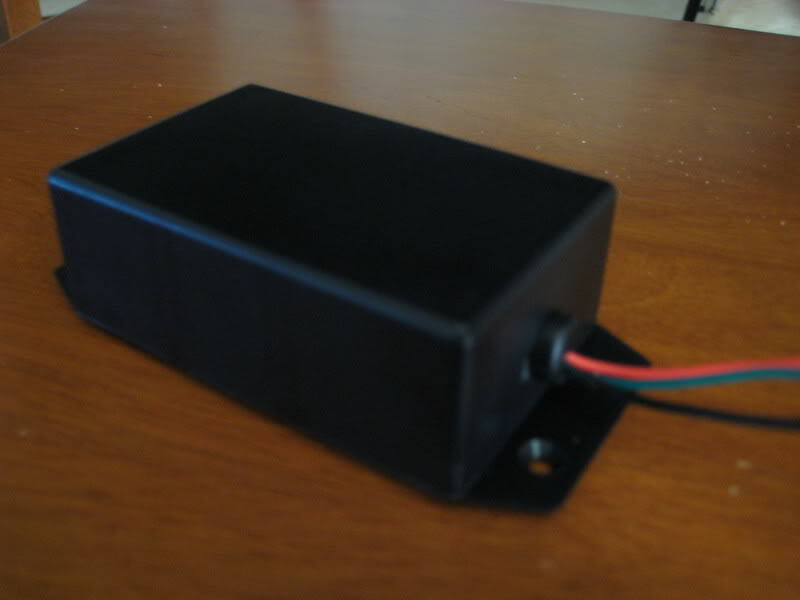 We build a momentary relay, so that when you turn your high beams on it activates your garage door opener for a second. This way, when you are riding around with your high beam on, your garage door opener is not constantly being pushed down and wasting battery. Im not going to go into specifics on how to actually solder and make circuits, but rather just show you how to set up this circuit. If you have any more questions, feel free to ask here or PM me. Oh yea, and I'm not responsible for any damage you do to your bike. If you don't feel comfortable soldering, you might want to skip this. To start, make sure everything will be compatible with your bike and opener. With the opener, you have to take the case off and find the button on the circuit board that opens your door. We solder 2 wires to each side of the button contacts so that we can activate the opener by touching the two wires together. If you can get this far, you should be good to go. Now, your bike has to have a switched 12v for the high beams in order for it to work correctly. It should work with all F4is, and any other bike with a switched 12v high beam wire. On the F4i, you will need to take off your headlight to solder in an extra wire to use. On the wiring harness on the bike (make sure you solder to the one on the bike, not on the headlights), right where the headlight connects with that big grey plug, you will need to find the WHITE wire, which is the switched 12v for the high beam (this will probably be different on other bikes, so check in your service manual to find out what color yours is). Now be careful here, because you have to cut this wire a few inches from the harness, and if you mess up you won't be able to turn on your high beams any more. Strip both ends of the cut part about 1/4 of an inch, and solder them back together with another wire soldered to the joint (don't forget heatshrink if youre gonna use it). So, you should have your wire back together where you cut it, with the addition of another wire soldered to the same joint. Make sure you use a wire that is long enough to reach wherever you want to mount your opener (I put it under the seat). Finish it with heatshrink or electrical tape and put your headlight back on. Last edited by axsys; 12-18-2014 at 09:20 AM. Really good writeup. I like the use of the light switch. I have mine in my inside pillar, but your location and use of the headlight switch is a clever idea. I was wondering when I did mine if you could use the blinker push button to do this same thing, I didnt do alot of research, just found it easier to use a MOM push button in the pillar. Just wondering if you gave any thought to other switches? I originally wanted to use the signal cancel button as the switch for my opener, but found out that the turn signal switch is more mechanical than electrical. When you turn on a signal, a little plate inside the switch is moved either left or right depending on which signal you turned on. When you cancel the signal, it just puts the plate back in the middle so that neither left or right are selected. It doesn't push a switch or anything, and therefore there is no wire or switch in the turn signal housing for when you push the button in. As far as other buttons go, the only options were the kill switch and the starter switch (both ideas are bad for obvious reasons) or the horn switch. I didn't want to be honking my horn when I come home late at night, so thats why I chose the high beam switch. You could wire it to the horn if you wanted to, all you would have to do is cut a different wire on the harness. Remote - $18, Velco - $1.50: Set up takes about 10 seconds. Thanks for taking the time to write this how-to. The solderable relay doesn't look like the one in the diagram so I took a few minutes to draw a diagram of what I did. 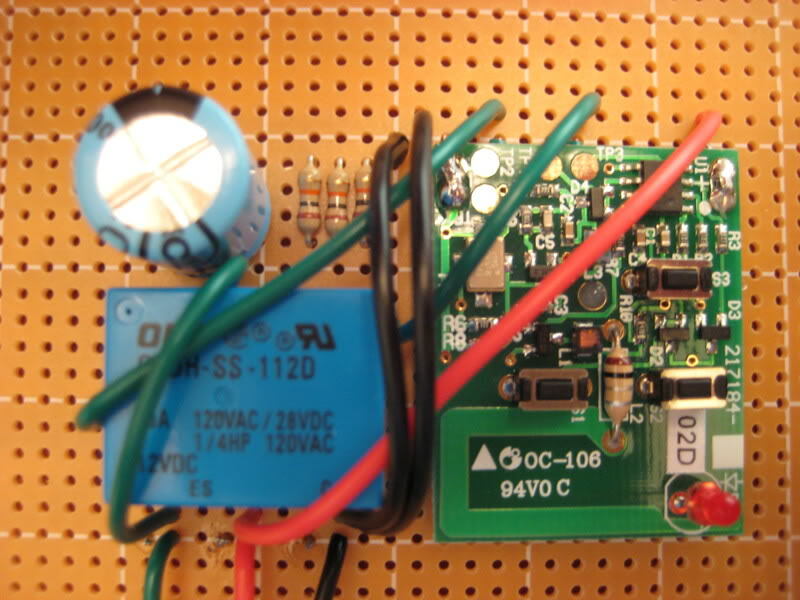 Instead of worrying about my remote battery going dead I placedthe opened remoteon the same board as my project and wired it directly to the battery on my bike. I now never have to worry about changing the battery. 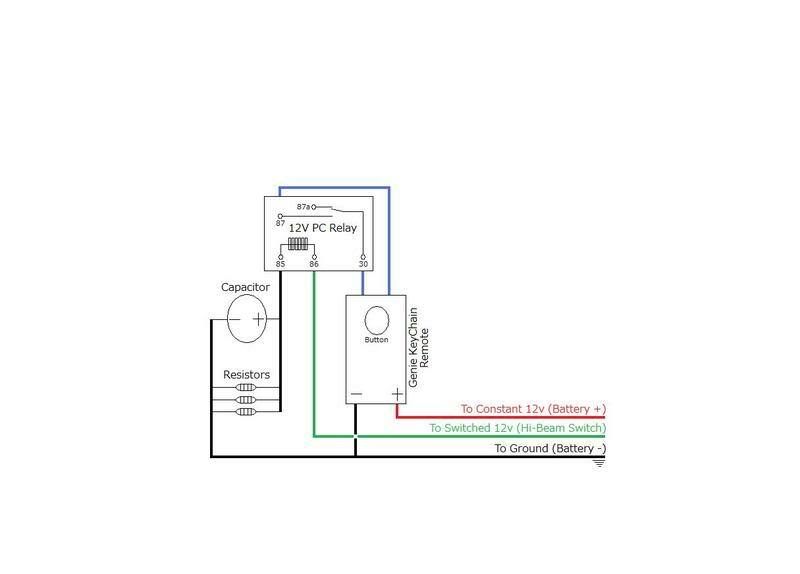 In the interest of saving room on the board it's not exactly like the diagram but the diagram shows how I wired everything. Here are a few pictures... let me know what you think. wjerlinger, that looks really good! you're lucky that your opener uses a 12v battery so that you don't have to be worried about the battery dying. 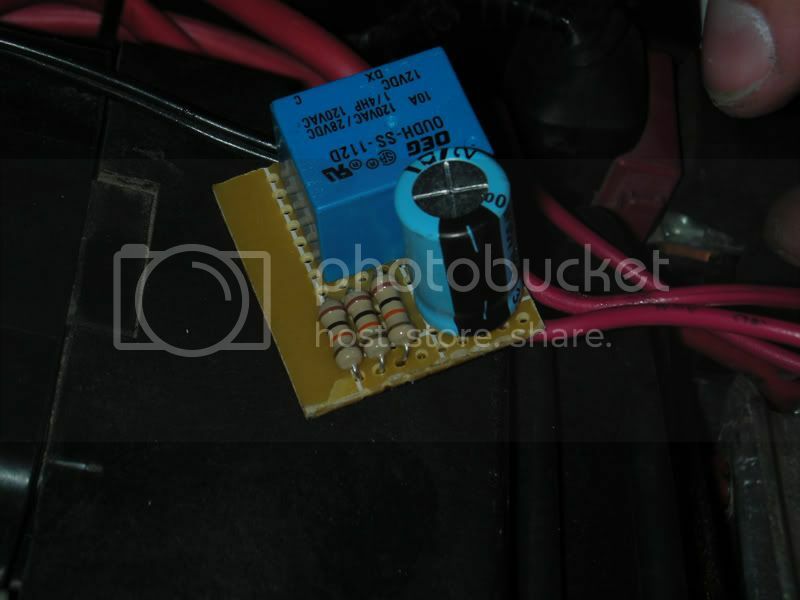 also, your wiring diagram looks nice as well and will definitely help some people. thanks for adding to this thread! Thank you axsys and wjerlinger! This worked great on my 1000RR and I had fun making it. It even impressed my wife (who normally could care less about electronics and motorcycles). No problem guys! I'm glad you got this done successfully on your bikes. Out of curiosity, does everyone else garage door opener work like mine where it activates when you turn the switch on and then once again when you turn the switch off? Yeah, mine acts the same way. If i turn the high beams on and off fast, then the garage door opener only goes off once. If I turn thehigh beamson and let it sit for 3 secs or more and then turn the high beams off, the garage door opener goes of 2 times, opening and closing.